What does the movie Lion tell us about why some societies grow rich and others remain poor? What can the global box office juggernaut, Jurassic World tell us about entrepreneurs and the ethics of business? Can the movie Passengers give us insight into human motivation and decision making? This book surveys more than 40 movies to answer these questions and much more. Movies do more than entertain. They project important insights, often unintentional, into the way the world works and the values society cares about. Indeed, their stories are often grounded in the real-world experiences of everyday people. As part of this, movies also provide a window into understanding and evaluating economic behavior. Economics is, after all, the study of how scarce resources like labor, capital, and technology are used to improve (or reduce) our welfare. It also helps us to more fully understand the consequences in our lives that result from those choices and decisions. Through exploring a wide range of films from Passengers to Victoria and Abdul, this book delves into economic concepts such as opportunity costs, profit maximization, greed, business ethics, monopoly, economic growth, and entrepreneurship. 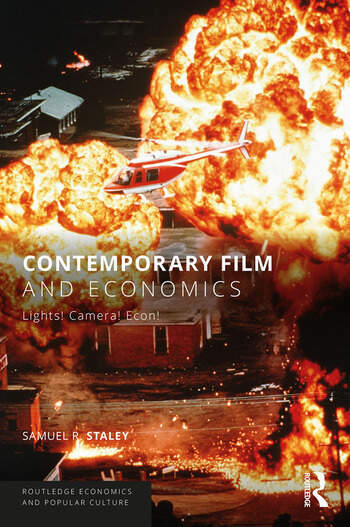 Contemporary Film and Economics is a must read for anyone interested in how movies project and interpret economic ideas, craft popular narratives for how economies operate, and explore motivations for economic behavior. Economists will find it useful in starting discussions on key concepts, while filmmakers will find the discussions of economic concepts a provocative way of thinking about how to craft engaging stories that are grounded in practical experience. Samuel R. Staley is an urban economist and director of the DeVoe L. Moore Center in the College of Social Sciences and Public Policy at Florida State University, USA. He is also a research fellow with the Independent Institute in Oakland, California as well as a public policy analyst, film critic, and award-winning novelist.